Essex already has a higher older population than the national average. Older people with care needs are projected to increase by 63% over the next 20 years to a potential 131,200 older people in need of social care and support. Essex County Council views the impact of loneliness as a complex and pressing issue for the authority. 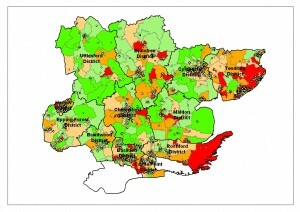 In order to determine which communities are most affected by loneliness, Essex County Council has developed a unique ‘Isolation Index’, using commercial demographic data. Different scenarios were explored by weighting the relative importance of the common factors, for example one scenario focused on older people that are widowed and in poor health. Another scenario placed emphasis purely on contact with friends, relatives and neighbours. The weighting varied between 0.5 (i.e. half as likely) and 3 times as significant, but the result did not vary substantially from the uniform weighting applied to all the common factors. The variables were then mapped at a Lower Super Output Area (LSOA) level to identify clusters of households that are potentially vulnerable to loneliness and isolation. The initial exercise showed 55,000 households were statistically likely to be lonely, or at high risk of isolation. 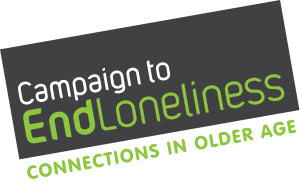 However, if the 37% of older people single occupancies in Essex is taken into account, over 80,000 people are statistically likely to be lonely. The index has been designed as an adjustable tool and it can allow the council to allocate priority by resource availability as well as risk. For instance moving the statistical risk to 1.75 times more likely (than an standard household) to be lonely brings us closer to the national average of 10-14% of older people who self-identify as lonely all or most of the time. Essex County Council is now working with the voluntary sector more closely to design a behaviour-change approach to encourage individuals and communities to build social networks and reduce their risk of loneliness.